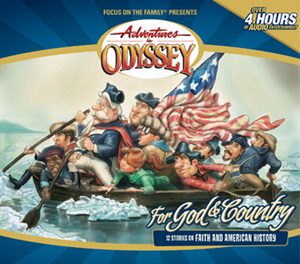 American history is one thrilling encounter after another when you experience these 12 timeless Adventures in Odyssey episodes! You�ll join Paul Revere on his famous midnight ride... meet President Abraham Lincoln as the United States is being torn in two... escape with runaway slaves on the secret Underground Railroad... and witness how "The Star-Spangled Banner" was composed on a battlefield by dawn's early light. "Listen, my children, and you shall hear Of the midnight ride of Paul Revere"! Marsha learns about some of the important events leading to the American Revolution through an exciting story from Whit. What did the Bible have to do with settling the Old West? Cody doesn't see what Christianity had to do with the "Cowboys and Indians." So, Jack tells him the story of a circuit-riding preacher named Klinger - and his quest to share the Gospel with a lost Native American. Whit puts the finishing touches on his new and improved Imagination Station and sends Marvin off on an adventure set during the American Revolution. Marvin Washington hears an often untold story of the American Revolutionary War.